As a continuation of my last blog post (in which we learned about a fairly weak chess engine called Turing), I’m going to offer some suggestions for new chessplayers who might be finding the Fritz12 and Rybka4 chess engines a bit too strong for them. In my experience, the biggest problem new players struggle with is motivation. You learn the moves, get all excited about this new game you’ve picked up, and then you lose and lose and lose – why would you come back to the chessboard again? First of all, there’s no shame in losing to a computer; the only person who knows about it is you. On the other hand, losing game after game can erode your morale. So what can you do? Note the slider for “Playing strength” near the top center of this dialogue — it will be the key to this whole “match motivation” process. The slider displays three numbers. The left-hand number is the minimum rating (the strength of the engine if you move the slider the whole way to the left). The right-hand number is the maximum rating (the highest playing strength you can get from the engine in Handicap and fun mode if you move the slider the whole way to the right). The middle number is the slider’s current setting. If you’re a rated chessplayer, move the slider until it matches your Elo rating (or is at least close to it, setting it to 5-10 points away from your actual rating isn’t going to hurt anything). However, if you’re not a rated player (or are a beginning chessplayer), just move the slider the whole way to the left as a starting point. After you’ve moved the slider, click the “OK” button. You’re now ready to start your match. You’re going to play a “pretend match” against your chess engine. You’ll play six games, alternating colors from game to game (so if you play the first game as White, you’ll play the Black pieces in the second game, then White in Game 3, etc.). Keep a record of the match score from game to game, with the winner of a game scoring one point and each player scoring a half-point for a drawn game. Your goal is to win the six-game match by scoring 3.5 points or more. But there’s more to this process. If you won the six-game match, start another match, but this time increase the strength of the chess engine by fifty points. If you lost your first six-game match, play another match, but this time decrease the strength of the engine by fifty points. In the case of a drawn match (scored 3-3), just play another match with the same settings. 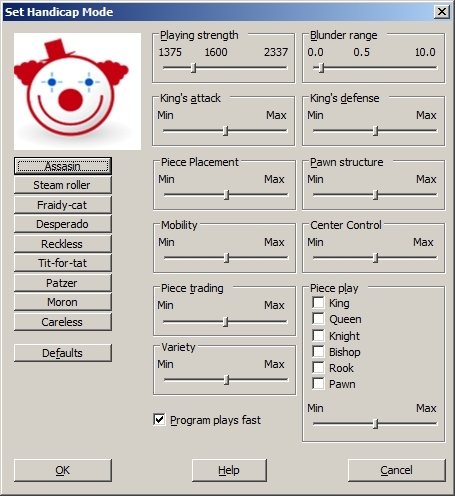 Changing the “Playing strength” slider’s setting between matches is like weight training; just as you add weight as you become stronger in weight training, you increase the chess engine’s strength with each successful match conclusion. That provides you with a little extra motivation to play games against the computer and, when you’re first starting out as a player, the best thing you can do is play as much chess as you possibly can – the experience is itself a valuable teacher, plus incidents from your games will provide you with reference points when you’re studying instructional chess books and disks (“Hey! I remember when that happened to me!”). Experienced players can also benefit from these “mock matches”. I’ve been playing chess for years and I still use this training technique even though I’m no longer a beginner. But what can you do if you’ve moved the “Playing strength” slider the whole way to the left and you still lose matches? Believe me, you have some more options. 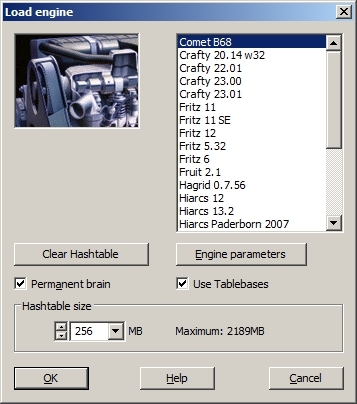 Click on the engine you wish to load (to highlight it) and then click “OK”. Playing imaginary matches against your “phantom opponent” (e.g. your chess engine) in the Fritz12 and Rybka4 interface is a great motivational tool if you take the process even halfway seriously. It’s like having a rival at the chess club who you really, really want to beat, and this will provide you with the motivation to play and study more chess than you otherwise might do. I greatly enjoy playing these “mock matches” against my silicon opponent and I hope you’ll enjoy them too. Hi Stevie, This site is very instructional for newbies like me. I always want to study different kind of pawn structures. my questions is how do i search for different kind of structures,like the scheveningen structures, slav / caro structures, lopez etc. Thanks!